The Forklift Attachment. 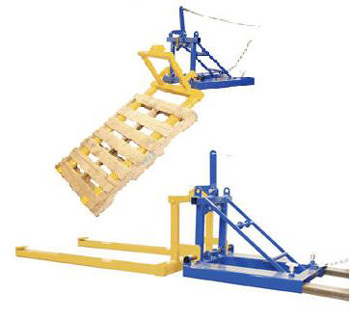 Pallet Dumper/Retainer makes it easy to dump loaded pallets without leaving the seat of your fork truck with the all welded steel constructed Pallet Dumper. Unit fits to forks and is secured by a safety chain. Two retainers hold the pallet in place while dumping the contents into the hopper or dumpster. Once the retainers have cleared the opposite end of the pallet, raise the forks and the retainers will hold the pallet on the forks. Lift the pallet to the dumping height and rest the pallet on the edge of the dumpster. Pull the chain, releasing the fork carriage, allowing the pallet to tilt and dump the load into the hopper or dumpster. When finished, simply lower until the carriage latches. Specs: Fork Pocket 7 1/2" x 2 1/2", Fork Length 52", Overall Width 32", and 2,000 Lbs Capacity.